Niles Audio Corporation has introduced a whole-house distributed audio system, the IntelliContro ICS (Integrated Control Solutions). 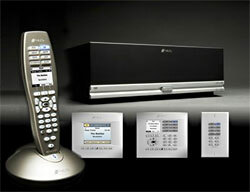 The IntelliControl ICS system accommodates popular digital audio sources and delivers detailed information to and from its keypad, touchscreen and handheld remote controllers, letting users put Sirius satellite radio in the kitchen, iPod audio in the kids’ rooms and AM/FM radio in multiple rooms, simultaneously. “Offering customers a flexible solution for integrating iPod, XM and Sirius satellite radio, as well as many other audio sources, into their whole-house audio systems was our primary goal-and to do so with a previously unattainable combination of control, ease of use, and value,” stated Frank Sterns, president of Niles Audio Corporation. “The IntelliControl ICS system provides all of the source information, known as ‘metadata,’and displays it on our handheld or wall-mounted controllers for intuitive system navigation and operation. Simple access to music via our ‘One Touch to Music’ feature and the ability to integrate any combination of sources through our modular approach results in the ultimate in convenience and flexibility, what we call unparalleled freedom of choice,” he added. At the heart of the system is the GXR2 Modular Multizone Receiver, the first receiver to use interchangeable tuner modules for XM and Sirius satellite radio, iPod, AM/FM and other devices known as “legacy” sources like CD, DVD and satellite TV. IntelliControl ICS features “plug and play” configuration, allowing simultaneous listening and control of a variety of music or programs to different rooms or zones throughout the house. The receiver accommodates any combination of up to six modules, and with additional GXR2s, the system is expandable to up to 30 zones, each with fully independent choice of source and control! IntelliControl ICS comes with a choice of four system control devices, including a unique wireless remote control dubbed the iRemote, which supplies detailed information (like song title, artist and album) to a user’s fingertips, allowing them to scan, select and play content from their ICS system just as if they were standing in front of a CD rack, satellite receiver or holding an iPod in their hands. Other ICS system controllers include a color touchscreen display and wall-mountable keypads, available with or without LCD displays. All control devices provide real-time user feedback in the form of “metadata” menus for intuitive source navigation and operation. Scheduled for release in May 2006, IntelliControl ICS products will be sold exclusively through Niles factory authorized dealers. No pricing information was included in the announcement.